Seller will give you a gift certificate in the amount of 5,0087 RUB for a positive review of the product purchased. 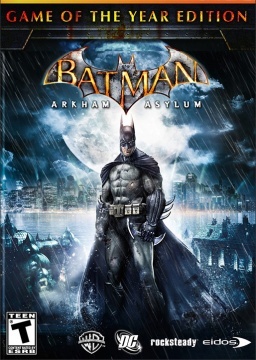 The critically acclaimed game "Batman: Arkham Asylum" (English Batman: Psychiatric Arkham) is back in the new edition of "Game of the Year", which includes 4 new maps for the test mode. New maps for the test mode - Alley of crimes; The Scarecrow´s Nightmare; Complete madness and Night hunter (the last two - from the set of cards "Mad night"). - Investigate the role of Batman, the greatest detective in the world, and solve the most complex puzzles with tools such as X-ray vision, fingerprint scanner, amido-black spray and a pheromone tracer. "Challenge Gotham´s greatest villains, like Joker, Harley Quinn, Poison Ivy and Killer Crock." - Become an invisible predator with Batman, having a unique surveillance camera, move imperceptibly to enemies and exterminate them without unnecessary noise. - Choose among many methods of extermination of enemies, including, you can dive on the enemy from the sky or stun him through the wall. - Investigate every inch of the Arkham Psychiatric Hospital, move freely around the infamous island, first presented so realistically. - Experience what it is like to be a Batman, using betarangs, an explosive gel, a bootleg, a code sequencer and a crossover. - Open even more secrets, performing hidden tasks, and get for them additional experience points that you can spend on developing and customizing your outfit. - Enjoy the complete freedom of Batman´s superhero using the hook to get to any place that you see, or jumping from any height and hovering in any direction. Seller will give you a gift certificate in the amount of 5,0087 RUB for a positive review of the product purchased..